Katy says: Santiago on a Sunday is an unusually subdued place, boring even. One of my first shocks upon moving here was hopping over to the Restaurant district of El Bosque Norte on a Sunday for lunch and finding restaurants empty or, in some cases, closed. The contrast to the hustle and bustle of Las Mercedes on a Sunday was startling. This being a long weekend, the city was even more subdued, until the news came out: former dictator Augusto Pinochet had died. I decided to step out to the places where each side was gathering, to mingle with Chileans and try to grasp what this meant for a divided country. In a city of six million people, the man’s death left no one indifferent. My first stop: Plaza Italia, meeting place of those celebrating the dictator’s death. The place was brimming with cops, and the mood was festive. 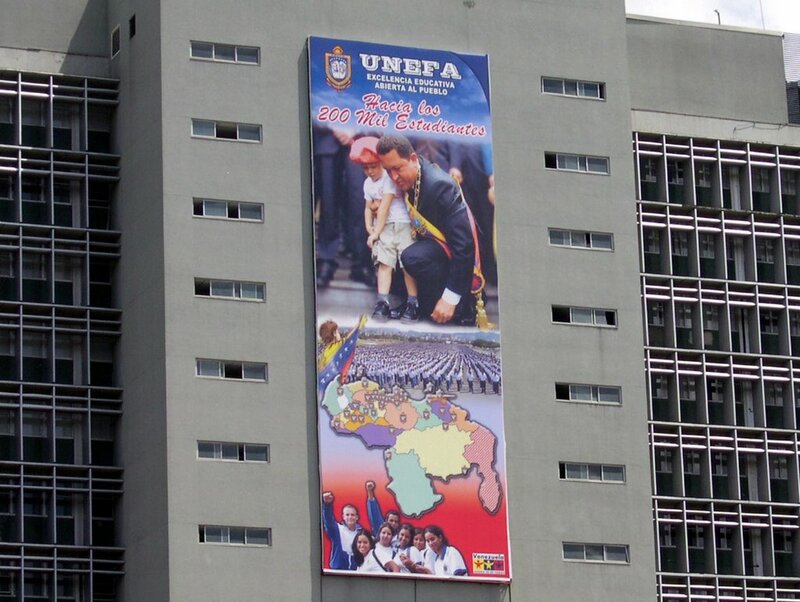 A huge banner advertising Andres Bello University made me feel a little less out of place, even though I was the only one there carrying an eighteen-month old toddler. Several banners made sure I knew not everyone there felt happy about the man’s death. The first reads “Death defeats justice”, while the second pair claims for divine justice and says that “El tata”, as his supporters used to call him, is now playing poker with Hitler in hell. A woman curiously resembling Pres. Michelle Bachelet was so happy that she took her top off and started dancing in the streets in jubilation. Well, at least her bra was black. As I inmersed myself into the crowd, the signs got more rustic and more raw. I was not surprised to find among the many flags being waved, my own Venezuelan tri-color, or at least what used to be my flag with the seven stars. We have definitely become part of the landscape of the Latin American left. I had never witnessed street celebrations for a person’s death. And while the mood was contagious, the common presence of Ché Guevara T-shirts and hammer-and-sickle flags made me question the commitment to human rights of many in the crowd. I drove a few miles to the East to the Military Hospital, where the General had died a few hours earlier. The crowd there was equally numerous and equally enthusiastic, chanting military songs mixed with anti-communist and anti-Bachelet cheers. The women in the crowd showed a special fondness for the General, coming out in droves with military headgear and pictures of Pinochet accompanied by small children. It reminded me of other pictures of military strongmen appearing alongside children to soften their image. As I drove home, I glanced at the modern office buildings in the El Golf neighborhood, with the Ritz Carlton hotel in the foreground. These gleaming monuments to Chile’s dynamic economy stood in sharp contrast to the reminders of Chile’s painful past that I had witnessed just a few kilometers down the road. One city, torn apart by the actions of politicians and men in uniform. The wounds are still open in this divided country, and the passing of one man will do little to heal them. During the course of the afternoon, my baby girl drew coos of admiration from rabid Pinochet supporters and from communist pasionarias. And even though she experienced the smell of marijuana for the first time in the anti-Pinochet rally, I’m glad I brought her along. Her bright-eyed innocence made me wish for a world without military strongmen, without divisiveness. My hope is that when she is older, both Venezuela and Chile – her native countries – will each be able to stand as a single nation. Previous articleWhy did more people vote for Chavez than for Rosales?